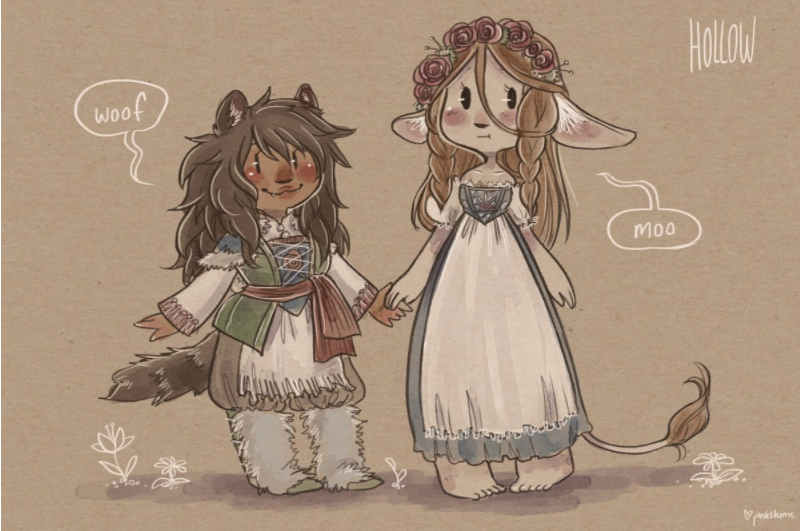 A fantasy queer romance based on traditional Scandinavian folklore with two adorable huldre wives and delicious Scandi food! Huldra are a type of Scandinavian troll, which have variations depending on which country they come from. They’re generally accepted to be temptresses, similar to Greek Sirens, who draw men into the woods to drain them of life. When viewed from the front, they are said to be beautiful beyond compare until they turn around. Their backs are usually depicted hollowed out like a tree trunk rotted out. Some Huldra have been described with a tail like a fox, or a tail like a cow. This is usually their give-away as one of the fair folk.Ildri, our Huldra, is a mixture of these folklores. She has an open back, and the tail and ears of a cow. Huldra are not necessarily completely malevolent. Several stories exist where a human has shown kindness to a Huldra, and she has rewarded them with generosity in return through crops or material goods. Typically they appeared to shepherds and coal-burners, seeking food or warmth. Huldra were powerful, but could be tricked into marriage by capturing them or drawing their blood. When they marry a man in a Christian church, their tail comes off and they lose their beauty, but their children are strong and retain their magic. Though nothing explicit will ever be posted in the story’s canon content, certain panels might be NSFW or not intended for an audience under 18. Due to the nature of Ildri’s body, some might find images of her hollow back disturbing. Also, while careful research has been conducted to root Hollow’s story in a believable culture, the story takes place in a completely fantasy environment, any resemblances of actual people or places are coincidental, and no harm is intended.